I assume this is an Echeveria.... Pls help me get more specific. I took this shot outside a nice restaurant that we went to, and I think it is common, but I can't find out what it is with any certainty. Any help would be great, and thanks in advance. Drought Smart Plants reply: Hi Oshi, well this is one case where it doesn't pay to assume anything! This gorgeous thing is actually a lovely specimen of Aeonium, and I was going to suggest tabulaeforme, which has that incredible dinner plant look of being almost flat, with the fish scale appearance of the leaves overlapping the previous layer. This one could be one of the others, as the foliage isn't completely flat. There are many gorgeous examples of this superb drought tolerant plant. Although related to Echeveria, as they're both in the Crassulaceae, it has some distinct differences. These plants will go dormant in the summer, right when the Echeveria are going crazy and loving the heat. They are also 'monocarpic' which means they bloom once, then the rosette will die. And, the flowers are completely different - the Aeonium bloom is a huge spire, covered on all sides with many small flowers, while Echeveria have a curved over spray of downward hanging bells. 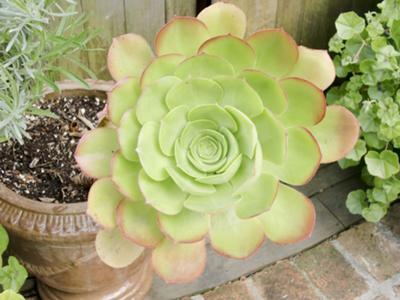 You can see more on this page (scroll through the entries by my visitors to see some more pictures) about Aeonium. Just to let you know, this pale lime green is not the normal colour, it's obviously lacking in nutrients where it is.